Not to be confused with Zhenjiang District or Zhanjiang, both in Guangdong. Zhenjiang, formerly romanized as Chinkiang, is a prefecture-level city in Jiangsu Province, China. It lies on the southern bank of the Yangtze River near its intersection with the Grand Canal. It is opposite Yangzhou (to its north) and between Nanjing (to its west) and Changzhou (to its east). Zhenjiang was formerly the provincial capital of Jiangsu and remains as an important transportation hub. The town is best known in China and abroad for its fragrant black vinegar, a staple of Chinese cooking. Prior to the adoption of Hanyu Pinyin, the city's name was typically romanized as Chin-keang-foo, Chen-kiang-fu, or Chinkiang. Former names include Jingkou and Runzhou. A part of Zhenjiang was the possession of Ce, who was created the Marquess of Yi in the early Western Zhou. Then the region was renamed Zhufang and Guyang, supposedly. 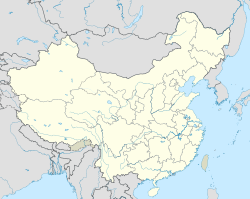 [clarification needed] After it was captured by the First Emperor of the Qin in 221 BC, it became a county seat and was given the name Dantu. A Chinese legend holds that the site's fengshui was so advantageous that the First Emperor ordered 3000 prisoners to dig a tunnel through one of Zhenjiang's hills to dissipate its qi. It became a prefectural seat during the middle of the 3rd century BC. The Sui took the city in AD 581 and made it an important garrison on the lower Yangtze, the source of its present name. In 595, it was made a commandery seat. Its importance grew with the construction of the Grand Canal, after which it served as the chief collection and transit center for the grain tax paid by the farmers of the Yangtze delta. The city flourished from the 10th to 13th centuries, when it produced fine silks, satins, and silverware for the Song emperors. The 11th-century scientist and statesman Shen Kuo composed his 1088 Dream Pool Essays during his retirement in a garden estate on the outskirts of the city. It was taken by the Mongolians during their 1275 campaign against the Song capital at Hangzhou. Under the Yuan, some Nestorian Christians were reported living in the city. The city fell to Xu Da on 17 March 1356. The Southern Ming placed the town under Zheng Zhifeng, brother of Zheng Zhilong and favorite uncle of Koxinga, although he was fooled into wasting most of his ammunition against a feint and abandoned the city to the Qing on 1 June 1645. Under the Qing, Zhenjiang was a city of half a million surrounded by a circuit of brick city walls up to 35 feet (11 m) high. It was captured by the British on 21 July 1842 during the First Opium War and after a fierce resistance, leaving the path open to Nanjing and prompting a concessionary treaty to avoid its loss. A decade later, massive floods of the Yellow River altered its course north of Shandong and closed the northern path of the Grand Canal. Soon after, the town was sacked by the Taiping rebels in 1853. It was recaptured by the Qing in 1858 and opened as a treaty port in 1861. Into the 1870s, Chaozhou merchants used their connections in Zhenjiang to make it a regional distribution center for opium purchased from the foreign merchants in Shanghai; when David Sassoon attempted to avoid taxation by delivering his cargoes directly to the opium merchants in Zhenjiang, the Chinese organized to intimidate his customers and then bought out his failed organization. The population was estimated at 168,000 in 1904. The southern part of the Grand Canal was obstructed in the early 20th century, although by that point the city was connected by rail to Shanghai and Nanjing. The Nationalist government revoked British concession at Zhenjiang in 1929. From 1928 to 1949, while Nanjing served as the capital of the Republic of China, Zhenjiang served as the provincial capital for Jiangsu. During World War II, the city fell to Japan's Shanghai Expeditionary Army in the morning of 8 December 1937, shortly before the capture of Nanjing, but local resistance to the Japanese is still celebrated among the Chinese. When the Communists won the Chinese Civil War and relocated the capital to Beijing, Nanjing resumed its role as Jiangsu's capital. Zhenjiang is still one of China's busiest ports for domestic commerce, serving as a hub for trade among Jiangsu, Anhui, and Shanghai. The trade mostly consists of grain, cotton, oils, and lumber. The other main industries are mostly in the field of food processing and paper pulp manufacturing. The prefecture-level city of Zhenjiang administers 6 county-level divisions, including three districts and three county-level cities. These are further divided into 77 township-level divisions, including 66 towns, 1 township and 10subdistricts. As in Nanjing, Zhenjiang's old Wu dialects have been entirely supplanted by a dialect of Eastern Mandarin. It is incomprehensible to the residents of neighboring Changzhou, whose dialect remains a form of Taihu Wu. Zhenjiang is most famous for its fragrant black vinegar. Chinese legend traces it to Heita, the son of Dukang, the supposed inventor of alcoholic beverages. Having forgotten about a vat of wine for 21 days, he found it had spoiled but now possessed a pleasant sour taste that could be used to compliment foods. The present recipe is said to date back 1400 years, with its major modern manufacturer—the Jiangsu Hengshun Vinegar Industry Co.—dating to 1840. Other local specialties include crab cream bun,[clarification needed] Chinkiang pork (镇江肴肉), and pickled vegetables. Formerly, households in Zhenjiang would prepare for the new year by eating a red-bean dish and avoiding rice. One bowl of beans was left on the table to feed the home's flies, from the belief that they would then avoid disturbing the family during the new year festivities. A natural spring in a park on the edge of Zhenjiang has been famed since the Tang (7th–9th century) as the best in Jiangsu for making tea. It is now marketed as the "First Spring under Heaven". The hilly scenery in Zhenjiang's southern suburbs was considered beautiful enough to be the theme of many landscapes by Chinese painters. The 15th-century Japanese ink-wash master Sesshū Tōyō studied in Zhenjiang. The local Jinshan temple appears in the tale of Madame White Snake and inspired a replica in the Kangxi Emperor's garden at Chengde. Zhenjiang is located in the convenient Yangtze River Delta transport corridor, at the crossroads of the Grand Canal and the Yangtze, and between the Shanghai and Nanjing economic regions. The Port of Zhenjiang is the third largest port on the Yangtze. The city has two Yangtze River crossings. The Runyang Yangtze River Bridge complex, which has one of the one of the longest suspension bridge spans in the world, connects to Yangzhou. The Taizhou Yangtze River Bridge, one of the longest cable-stayed bridges in the world, connects Yongzhong with Taizhou. Zhenjiang has been connected by rail since 1906, at the completion of the Nanjing-Shanghai Railway. The railway was extended to Beijing after the completion of the Nanjing Yangtze River Bridge in 1960, connecting Zhenjiang to China's political and commercial hubs. The primary railway station was Zhenjiang West Railway Station, which was demolished in 2004 due to congestion it caused in the city centre. Since then Zhenjiang Railway Station has served as the city's principal railway station. Since April 2010, Zhenjiang has been on the route of the Shanghai-Nanjing Intercity Rail, the first high-speed rail with a design speed of over 300 km/h (186 mph) to serve the city. In 2011, the Beijing–Shanghai High-Speed Railway was completed. Trains on the line stop at Zhenjiang South Railway Station. The two high-speed lines have reduced travel time between Zhenjiang and Shanghai to under an hour, and travel time to Beijing to under five hours. Rail service to Shanghai is frequent - averaging one train in less than half an hour. Zhenjiang does not have a commercial airport within its city limits, although there is a military airfield, Zhenjiang Dalu Airport (镇江大路机场), which may open for regional flights in the future. Zhenjiang city centre is 62 km (39 mi) away from Changzhou Benniu Airport, about one-hour drive (80 km or 50 mi) away from Nanjing Lukou International Airport via Nanjing Provincial Highway 243, and approximately two-hour (143 km or 89 mi) drive away from Sunan Shuofang International Airport. Check-in facilities are available for Lukou Airport in the New Zhenjiang Bus Station (镇江汽车新站). Zhenjiang is on the route of Beijing-Shanghai Expressway, and China National Highway 312. As of 2014[update], Zhenjiang had an extensive number of bus routes - numbering nearly one hundred. Since 2012 the city's entire fleet of city buses are equipped with GPS and are managed centrally through a "smart transport network system." Zhenjiang Export Processing Zone was approved by the State Council on March 10, 2003 with a total planned area of 2.53 square kilometres (0.98 square miles). The first-phrase project completed in December 2003 covers 0.91 square kilometres (0.35 square miles) and was certified by the Customs General Administration and other seven ministries for operation on Dec.24, 2003. Zhenjiang Export Processing Zone is located close to Changzhou Airport and Zhenjiang Port. Public institutions having full-time Bachelor's degree programs include Jiangsu University (江苏大学) and the Jiangsu University of Science and Technology (江苏科技大学). Zhenjiang is home to the Silkworm Raising Research Institute of the Academy of Agricultural Science of China. The Shaozong Library includes a 100-volume collection of sayings and proverbs dating from the 7th to 11th centuries. Senior high schools are Jiangsu Provincial Zhenjiang No. 1 High School (江苏省镇江第一中学), the Zhenjiang High School of Jiangsu Province (江苏省镇江中学) and the Jiangsu Provincial Dagang High School (江苏省大港中学). Pearl S. Buck also known as Sai Zhenzhu (Chinese: 賽珍珠), (1892–1973), Nobel Prize-winning author of The Good Earth and other novels about China, lived in Zhenjiang with her missionary parents until the age of 18. Her parents' home is preserved on the grounds of a semiconductor factory in Zhenjiang; nearby is Zhengiang Number 2 Middle School at which she studied and taught. Li Lanqing (born 1932), former vice premier of China. Shen Kuo (1031–1095), Song Dynasty Scientist. ^ “宜侯夨”青铜簋 (in Chinese). National Museum of China. Retrieved 2018-08-18. ^ 江苏省志·地理志 [Provincial Gazetteer of Jiangsu, Volume on Geography] (PDF). 1999. pp. 83–5. ISBN 9787806432662. ^ Chen & al. (2009), p. 243. ^ Chen & al. (2009), p. 254. ^ Lee (2005), p. 236. ^ "RightSite.asia - Zhenjiang Export Processing Zon". ^ "Testvértelepülések". Retrieved 30 April 2014. ^ "Cities abroad keen to forge ties with Kuching". New Straits Times. 2 August 2012. Archived from the original on 4 June 2014. Retrieved 4 June 2014. ^ Евразийское региональное отделение Всемирной организации "Объединенные Города и Местные власти". www.euroasia-uclg.ru (in Russian). Chisholm, Hugh, ed. (1911), "Chinkiang" , Encyclopædia Britannica, 6 (11th ed. ), Cambridge University Press, p. 233 . Chen Fusheng Li Li; Qu Jiong; Chen Chunxu (2009), "Zhenjiang Aromatic Vinegar", in Lisa Solieri; Paolo Giudici (eds. ), Vinegars of the World, Springer, p. 254–5 . Wikimedia Commons has media related to Zhenjiang.